Ever walk into a room and notice the quiet character perched up against the wall, timidly looking around the room, terrified that someone may come over and actually talk to them? Well, if that person was a fish, they would be a Spotted Trunkfish. This shy yet curious character is a member of the Ostraciidae, family of distinctive squared bony fish (write that down and see if you can’t work that word into your next conversation - we dare you!). 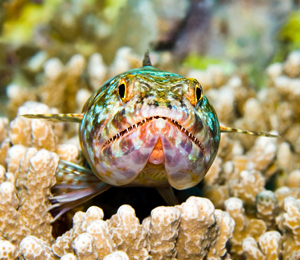 The strange looking Spotted Trunk Fish can be found in coral reefs around the Indian Ocean, south eastern Atlantic Ocean and the Pacific Ocean. 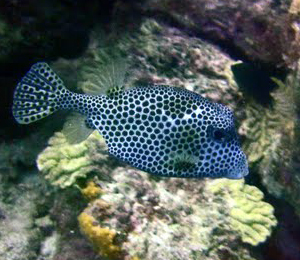 The Spotted Trunkfish gets its name from, yes you guessed it, the myriad black spots that cover its golden yellow body. Not only is this funky looking fish, but it also secretes a colorless toxin from its glands whenever its touched. Don’t worry, the toxin is only unsafe if its ingested, so there is no concern to divers, but if you do happen to be snorkeling, and you come across a spotted trunkfish, it’s not advisable to touch it! And another fun fact, one of the major predators of this fish is the nurse shark, and if a nurse shark ingests it, it can die! The body of the trunkfish is protected by a bony outer surface, that performs as body armor, including two extremely sharp spines to protect its rear fins. The Spotted Trunkfish is an omnivore, and its diet consists most of algae, sea cucumbers, sea urchins, mollusks, marine plants and crustaceans. They’re big fans of warm temperatures and thrive in places between 22 and 26 degrees C (72 and 79 F), and in depths of 4.5 to 18 meters (15 and 60 ft), which means if you’re on a shallow dive, this is definitely a species you could come across, so don’t forget your underwater camera! 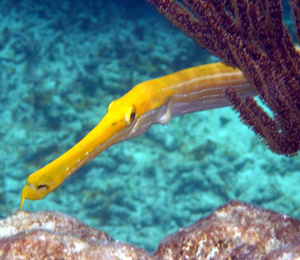 See this tropical fish and more in the water of the Bahamas.